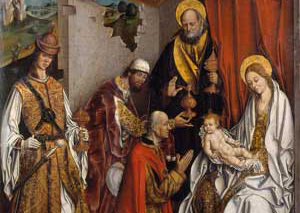 Epiphany is always celebrated on January 6th every year. It celebrates two things of Jesus's early life: the coming of the wise men and when St. John baptized Jesus. Since the beginning of the Christian holiday people get together like on Christmas and enjoy each others company. It is seen almost as a continuation of Christmas. January 6th is seen as the day that the wise men came to visit Jesus with their three gifts. So the day was chosen to celebrate two very important doings in Christ's life.